The final films are out. 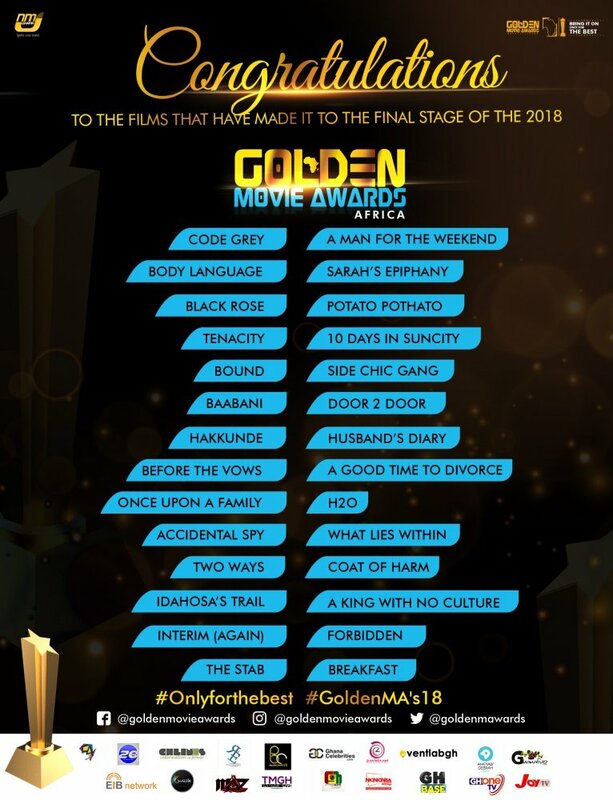 The organizers of the Golden Movie Awards Africa (GMAA) announce the list of films that have qualified for the final stage of the process. Furthermore, the nomination announcement will be in Cote d’Ivoire on the 20th of May 2018. Moreover, the various categories of the qualified films will be announced. The main event is in Ghana on 2nd June 2018. Furthermore, the organizers introduced a new feature for the awards dubbed “the golden spotlight”. This is to give upcoming musicians the chance to grace the stage on the night of the event. However, the organizers state that no tickets will be sold. Therefore, stakeholders and filmmakers are to apply on the website www.goldenmovieawards.com for tickets to the event which will take place on 2nd June 2018 at movinpick hotel.